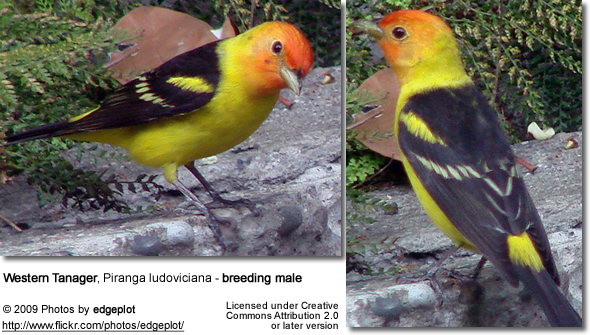 The Western Tanager, Piranga ludoviciana, is a medium-sized Tanager. Adults have pale stout pointed bills, yellow underparts and light wing bars. Adult males have a bright red face and a yellow nape, shoulder, and rump, with black upper back, wings, and tail; in non-breeding plumage the head has no more than a reddish cast and the body has an olive tinge. Females have a yellow head and are olive on the back, with dark wings and tail. The song of disconnected short phrases suggests an American Robin's but is hoarser and rather monotonous. The call is described as "pit-er-ick". Their breeding habitat is coniferous or mixed woods across western North America from the U.S.-Mexican border as far north as southern Alaska; thus they are the northernmost-breeding tanager. These tanagers migrate, wintering from central Mexico to Costa Rica. Some also winter in southern California. The Western Tanagers build flimsy cup nests on horizontal tree branches, usually in a conifers. The hens lay clutches averaging four bluish-green eggs with brown spots. These tanagers forage high in trees, sometimes flying out to catch insects in flight. They mainly eat insects, fruits and berries.